For ages salt or sodium has been pointed out as the villain who causes the life harming hypertension. Though recent studies which took a deeper look into the issue shows that the story is more complex. The latest study results actually take the blame away from sodium being the sole cause of hypertension. In a focused study recently the team found out those research participants who consumed less than 2500 milligrams of sodium every day had much higher blood pressure than those who consumed sodium in higher quantities. The results were counterintuitive as the dietary sodium intake which was positively associated with systolic and diastolic blood pressure proved to be the opposite. In fact the researchers came to the conclusion that there was a relationship between cardiovascular risk and sodium which means that low-sodium diets and very high sodium diets both carry a higher risk of heart disease. When a person consumes sodium moderately then you sit in the middle of the curve and your risk for cardiovascular disease is on the lowest side. The importance of potassium in our daily diet is highly emphasised. The research studies proved that the individuals with the lowest blood pressure were those who had the optimum intake of sodium and potassium. On the other hand those with very low consumption of dietary sodium and potassium had the highest blood pressure. Similarly magnesium and calcium intake was also of prime importance and found that higher intakes meant lower blood pressure. The study recommended not below 2.3 milligrams sodium intake per day for healthy adults. This shows that there is definitely an inverse association between sodium, potassium, magnesium, calcium and blood pressure. There is no denying the importance of increasing the intake of foods rich in potassium, calcium and magnesium which will help in maintaining a healthy blood pressure. Certain people may be sensitive to sodium and they should reduce the amount of salt in their diets. Not too long in the future there will be systems to screen the salt sensitivity which will help in finding out which person has to curtail salt in the diet. 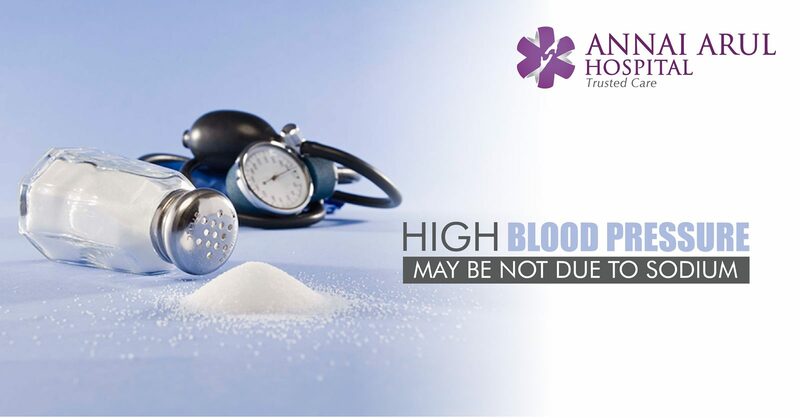 Thus the association of salt or sodium to high blood pressure is now not so vital but depends on a lot of associated things and dietary habits.